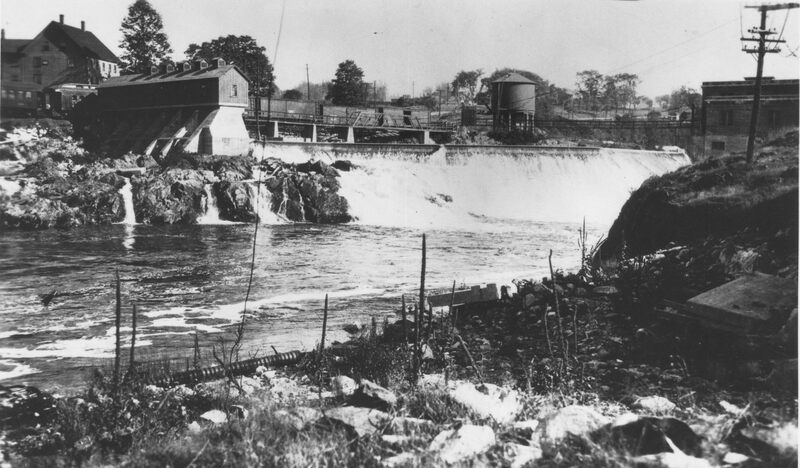 Salmon Falls in Milltown is one of the most historic geographical sites in the St Croix Valley. 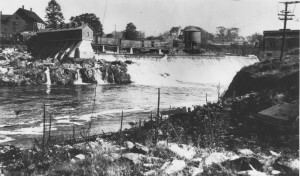 The Falls are located just down the hill from Knight’ s Corner and are easily accessible by the road which until the 70’s went to the Beckett warehouse and was most recently a redemption center. 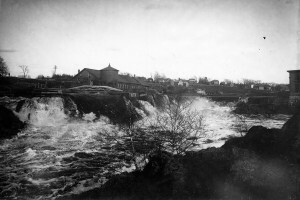 The photos above were taken from the Canadian side and show the Falls with Knight’s corner on the US side in the background. 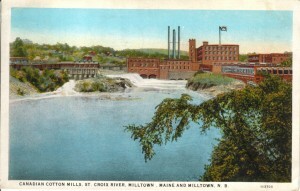 In the foreground is the Maine Central railroad terminal and warehouses. 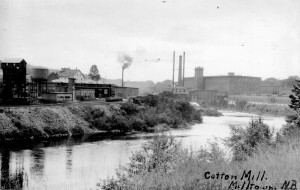 The first shows the Cotton Mill which dominated the view across the river from Knight’s Corner for over 80 years. “On this Indian reserve, extending from McDougall’s lot at Stillwater to Brown’s lot below the Salmon Falls, lie nearly all the principal streets of the town of Milltown. The place was one of much importance to the Passamaquoddies, not only on account of the ‘dipping fishery,’ but also because it contained one of their tribal burying grounds. It seems to have been to them a sort of holy ground long before the white men came; for there is a tradition that here, on some spot near the Salmon Falls, was the fire from which the Schoodic took its name, (literally, ‘where it burns,’ or, ‘where it is burnt.’) This fire, probably connected with some of the mystic ceremonies of the tribe, is said to have been kept burning throughout the fishing season. 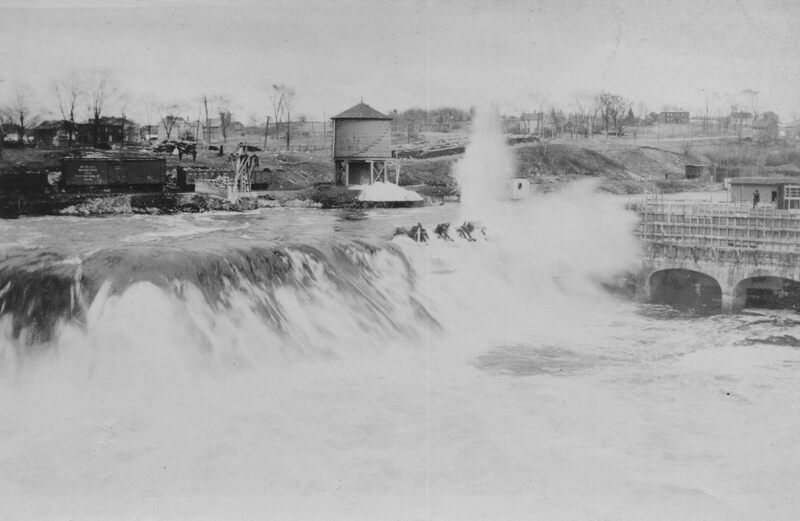 The wonder-working fires of the cotton mill furnaces may now, perhaps, be burning upon the very spot on which the aborigines made their votive offerings to the spirit of the stream, or invoked the mighty Glooscap’s aid. 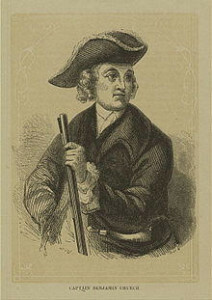 Of course the Passamaquoddies were not involved in any way in the violence but this did not prevent the English from sending Colonel Church, a truly despicable and villainous character, on a “punitive expedition” to the St Croix Valley with orders to kill or capture any Frenchmen or native he could lay hands on. He was paid $20 for each prisoner or scalp he took back to Massachusetts. While raiding the mouth of bay at St. Andrews and Eastport and killing and capturing some Frenchmen and Indians, he learned of the Salmon Falls encampment and the presence of many Indians and the cabin of a Frenchman named Sharkee and his wife nearby. 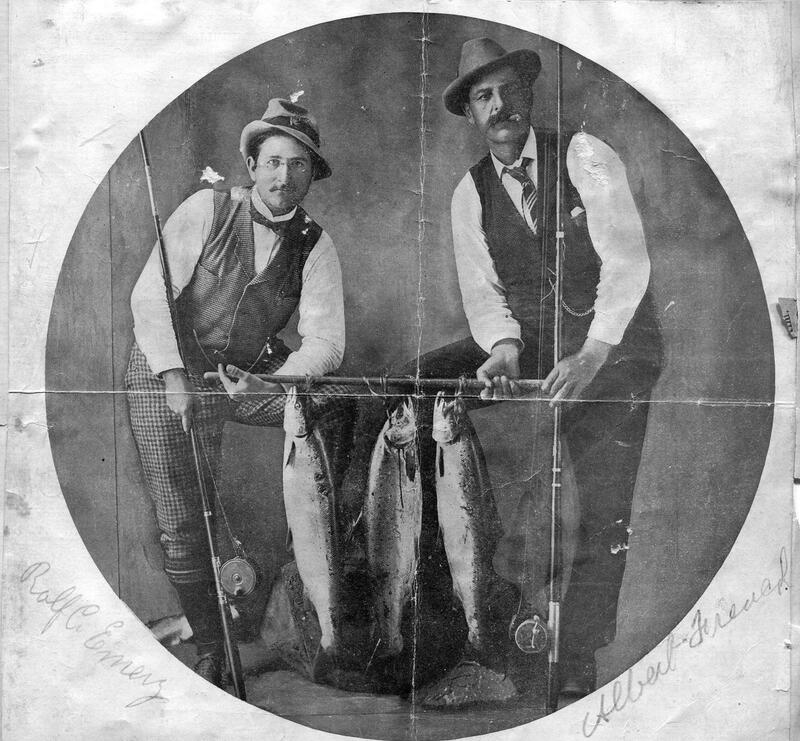 In more recent history Salmon Falls truly lived up its name a place where the salmon of great size and quantity could be taken. Above Albert French and Rolf Emery proudly display a day’s catch at the Falls in the late 1880’s. Albert French rescued the young son of Captain Lunn from drowning at Union Mills on Sunday evening. Young Lunn, with other boys in a row boat, approached the boiling water at the foot of the falls when the former became frightened and jumped overboard. Mr. French, seeing the peril of the young man, pushed from the shore with his punt and rescued him. He was quite exhausted when taken from the water. 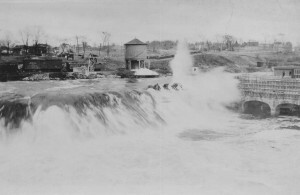 We’ll leave you with this photo of the Cotton Mill and Main Central Railroad rail yard taken from below the Falls. To the right is the Cotton Mill and to the left the very extensive and, in its day, busy rail yard on the US side at Salmon Falls. The larger buildings were bought in the 1950’s by Beckett’s and became their primary warehouse. The turntable was removed only last year. The best view of Salmon Falls is from the Canadian side in Milltown NB. Only from this vantage point can you see, especially when the water is high, the tremendous force and volume of water passing over the falls.